On my parents' wedding anniversary,my two elder brothers surprised my amma with a Microwave oven.I felt very happy hearing that! !Ever since,my brother(yeah! 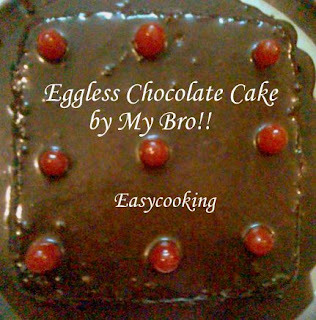 )has been asking me for an eggless cake recipe so that he can make it on his own.I suggested my own version of Eggless chocolate cake which I got from Shilpa's blog.But maybe,he wanted to try another one,so he just asked me about the power and time settings.I was also anxious to see how this new recipe came about.He surprised everyone and made a wonderful cake..though the recipe is from a Cookbook(he's not gonna be very happy reading this,hehe). Jokes apart,he made not one but 4 cakes..yeah you read that right,pretty cool for a newcomer in kitchen,right?He called me up and said the cake dish was medium sized,so I suggested he bake it in two pans.It seems,the cake in the smaller pan got over the moment it got inverted into a plate.The second one,in a big pan was kept aside for fudge topping.He was so surprised and impressed with his own efforts that he decided to bake two more.Here comes the funny part,the third one also came out well.But the fourth and the last one was neglected too much and it got burned.I couldn't control my laughter when I heard this..;-)Anyway,cheers to my bro Somannu,who incidentally celebrates his birthday today. Happy Birthday to you my dearest Somannu..Love ya!!! A quick microwave chocolate cake that nobody can resist!!! Grease an 8 inch round microwave safe dish.Line with butter paper. Sieve flour,baking powder and cocoa powder thrice. In a seperate bowl,beat butter and sugar till fluffy. Add vanilla essence,curd and baking soda,beat well. Add 1/2 of the flour mix and 1/2 of the milk,mix slowly and repeat the same process twice till everything is mixed well. Transfer to the dish and microwave uncovered at 60 % power for 11 minutes. Cool for 10 minutes and invert into a rack or a plate. Mix icing sugar,coffee and cocoa powder. Take butter and milk in a bowl and microwave at 60 % power for 1 and 1/2 minutes. Add rest,mix well and pour over the cake. Delicious chocolate cake with fudge icing is ready!!! Love the cake, especially as it is done in MW. Till now i have never ventured baking in MW. long time,..where were u...nice cake,..my wishesto ur bropther,. Hey its good to know that ur bro made thid cake...looks delicious. 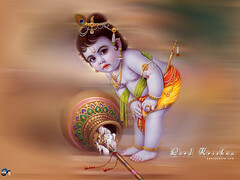 Hi Divya YOu have a B'day Surprise in my blog. lovely cake for a first timer. Happy b'day to your brother. OHHHH my god.......Som made only this cake....But 04 of his friends including me suffered a lot for 02 days.....!! he has not taken a single piece of that cake.....!! Poor Big 'B'...he was in toilet for almost 02 days.....!! SOM never make such cakes in your life....please....!! Hello Sujatha,this cake is made in mw mode,hence the power mode.Power denotes the heat/temperature required to mw.Usually it is in %,hence I've given the power %.If your mw has a power button,keep pressing it till it reaches the desired percentage.Some mw will only have low,medium and high percentage,in that case use the medium power level.Hope this helps!